From full-frame mirrorless and medium format to megapixel madness, there were plenty of cutting-edge cameras in Cologne. Has the industry gone mirrorless mad? On look at the launches of Photokina 2018 and you would thinks so. Though 2018 has already having seen the debuts of the Nikon Z6 and Z7 and Canon EOS R full frame mirrorless cameras, the world’s largest photography exhibition nevertheless saw some cutting-edge new cameras both presented and previewed. GoPro couldn’t wait until the show began to unveil its Hero 7 Black, but here’s what everyone else launched in Cologne that you need to know about. All hail the first full-frame mirrorless cameras from Panasonic. 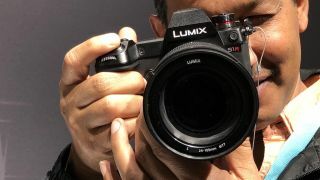 A follow-up to the Lumix GH4 and GH5, the Lumix S Series is topped by the S1R, whose 35mm full-frame image sensor offers a whopping 47 megapixels. However, the bigger news is on the video side, with the S1R able to record in 4K 60fps. Just as interesting for those considering moving to full-frame mirrorless from a full-frame DSLR is the S1R's double slot for XQD and SD cards. It was also announced that the S1R will benefit from the Leica L-Mount Alliance; cue incoming interchangeable lenses from Leica and Sigma. Also in Panasonic’s Lumix S Series is the S1, a step-down from the S1R that nevertheless boasts some top specs. You'll have to settle for a 24-megapixel sensor, but the S1 can also shoot video in 4K 60fps, and also packs that double SD card slot, so has plenty going for it. It's also compatible with the L-Mount lenses. The S1 and its bigger brother, the S1R, will both launch early in 2019. OK, so this probably is not going to be your next camera, but it’s always good to keep up with cameras that claim ultimate photographic performance. Cue Phase One’s XF IQ4 150MP, which as the name suggests, offers 150 megapixels. It also got 15 stops of dynamic range and capture one inside four post-producing your images in camera. Who needs Photoshop? A completely modular camera system, this medium format master will go on sale in late November/early November for US$51,990. Although it wasn’t new to Photokina, Cologne saw the unleashing of a brand-new colour for Leica’s most affordable camera. Having previously been available in green, this instax print analogue camera is available now in the much more conservative (and, let’s face it, much more likely to sell) black. Using either colour or black-and-white instax mini film to produce credit card-sized prints, the Leica Sofort costs £275. Away from the fanfare over its previously-announced EOS R, Canon used Photokina to announce the PowerShot SX70 HS – an upgrade of its SX60 – that takes the superzoom concept to even greater lengths. The key feature on this bridge camera is a 65x optical fixed lens zoom lens that’s equivalent to a 21-1365mm focal length. With its DIGIC 8 processor giving a 20.3 megapixel sensor and able to shoot 4K 30fps video, it covers most of the bases for an all-round camera, even capturing images in RAW. It goes on sale in November for £519.99. Are you a fan of optical viewfinders? And looking to spend five figures on a camera? If so, get eyes-on with Leica's brand new S3, a medium format camera that swerves the trend for electronic viewfinders. It won't be released until spring 2019 and details are sparse, but we do already know a few things about the S3; it will have a 64-megapixel sensor, 4K video recording using the full sensor size, and deliver 3fps burst shooting. No word yet on pricing, but expect it to be at least US$20,000. Despite being touted as a 'concept', this 100-megapixel mirrorless model from Fujifilm will go on sale early in 2019 for an eye-watering US$10,000. For that you get the first medium format camera with both built-in image stabilisation and on-sensor phase-detection pixels. There’s a notable focus on aesthetics and usability; it’s got an integrated vertical handgrip, and despite having a sensor that's 1.7-times the size of a 35mm full-frame sensor, the GFX 100S is a similar size and weight as a high-end DSLR. The GFX 100S also indulges in 4K 30p video recording. An upgrade of its GFX 50S, Fujifilm’s GFX 50R (the R stands for Rangefinder) is a dinky medium format mirrorless camera that's a tad smaller. Key specs include a 51.4-megapixel sensor, Bluetooth for image transfer, and an electronic viewfinder. It goes on sale in November for £3,999 (body only) and £4,500 (with a 50mm f/3.5 lens). For some cameras, Photokina comes too early, and without a price or a release date, the Ricoh GR III certainly seems to fall into that category. The Photokina preview of this cute fixed lens compact revealed little apart from a 24.2 megapixel APS-C sized sensor, a fixed 28mm equivalent f/2.8 lens, and a USB-C connection. However, Ricoh did confirm that the Ricoh GR III would also have a newly designed lens, a new image sensor, and a new imaging engine, and that it would be 'designed to be the ultimate snapshot camera'. Expect it to go on sale in early 2019. Amid all the high-end cameras and cutting-edge mirrorless tech, there were a few fun cameras at Photokina too. Fujifilm's Instax SQUARE SQ20 is the first hybrid in their range, letting you add filter effects, capture video and - crucially - allows you to preview your shots before you print them. Perhaps the most frivolous announcement was Fujifilm's further reveal of some new colours for its popular instax SQUARE SQ6 model: Ruby Red, and Aqua Blue, plus a Taylor Swift-designed version. Using a square 1:1 square format, the SQ6 it is all about simplicity, and selfies; there's even a small mirror to the side of the lens for framing a selfie. The new colours will be available from November this year. Swift’s version will be with us on 20 October.